Mark and Shaun's Beer Blog: Michelob Winter's Ale - Aging "On" Bourbon Barrels? Michelob Winter's Ale - Aging "On" Bourbon Barrels? Tonight I realized we were out of beer we could "just drink" in the fridge. So I waded through the cases of beer patiently aging and waiting for that unknown future date and headed out to pick up something at the store. A new beer from...Michelob...caught my eye. Yeah you read right. I'm trying a Michelob. And writing a review! A-B has been reshaping Michelob into their specialty brew division and working at creating more craft style small batch beers. i applaud the effort to get with the program. This is their winter offering. It's called "Winter's Bourbon Cask Ale." It's described as "Aged on Bourbon barrels with vanilla bean." Between you and I, the apostrophe in winter's and the "aged on" bit, there seems to be a ton of corporate adverspeak going on here. Which is never a good sign. 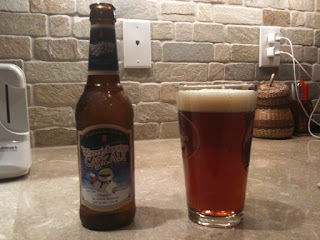 Using the power of the internet I was able to uncover that it is billed as a spiced winter ale style beer. It is aged for an undetermined length of time in their aging tanks with bourbon barrel chips in them. Similar to the process bud uses for their "beechwood" aging process. Not quite what I was hoping for. So they carved up some bourbon barrels and used them to flavor the beer. This can work if given enough time but that's not the point of barrel aging beer. Pulling flavor is only 1/2 the equation and to some brewers, only incidental. My first advice: If you really want to appeal to the craft beer crowd say what you mean and tell us what's really going on. You'll earn yourself legitimacy points that way. On to the beer itself. It pours a clear amber color with a fine foamy head. There is a candy sweet vanilla aroma followed by a slight hint of malt. It looks a little light for a winter but all in all dark for a macro brew. The sweet nose gives me some pause though. Oh the vanilla! My first though upon drinking was imitation vanilla extract. It may be real but it's so syrupy sweet and overpowering that it's too much and tastes fake and forced. There is light carbonation and some maltiness mixed in but the vanilla stays so long on the back of your tongue that it really does drown out the rest. I don't think your buddy that drinks crap beer will like the syrupy sweetness and I don't think your beer geek buddy who knows good vanilla and barrel aged beers will like it. This reminds me of J.W. Dundees Honey Brown ale back in the 90's. I don't know where they actually put the bourbon barrels or for how long, but there was no taste or feel from them at all. Maybe "on" meant physically in a container that was resting on top of the Bourbon barrels? I give Michelob credit for trying this out and I encourage them to keep refining and going after the craft beer styles. They're a smart bunch with tons of money and great facilities. They'll hit the mark eventually. Pros: Good bait when trolling for college girls. Cheers to Michelob for actually recognizing the matureing beer market and attempting a more sophisticated beer! cons: Waste of good bourbon barrels. How many Mexican children must have died to bring enough vanilla to market to make this beer taste this sweet? Verdict: B+ for effort but a D for taste. Unless you're going to make an ice cream float with this don't bother.